Hydraulic and bifold barn doors in modern wooden farm buildings require special design considerations. Build the door too wide and too high, and it still might be too small. So think BIG! Bigger is proving better when specifying the size of doors in farm shops and machine sheds. "Schweiss has never had a customer come back and say the door we installed was too big." It boils down to this: When planning your new shop and door package, you're better off going too big, than too small. We simply say, "Do it right the first time." Today's aggressive farmers are definitely going for bigger doors. We hear from farmers throughout the country, "Our shed doors are 24' wide but now we need a door to accommodate the new combine head we are about to purchase." Another common statement, "When we come home from the field, we want to be able to drive the combine directly into our shop." If someone is telling you "there may not be any need for a reinforcing header or structural bracing," be aware. As we all know, all buildings are not the same. Today wooden buildings come in many different designs, and every company is claiming they have the best. That's the time to ask some important questions such as 1) "Have you ever built a building using a large bifold or One-Piece hydraulic door?" or 2) Does the building company beef up your building to accommodate a door for the large opening? Or 3) Is the building company providing any extra structural reinforcement to the building to carry the load of the door? 4) Is your builder following the door manufacturer's specs? Your door very likely will be the largest piece of moving equipment on your building The building structure must support the door in all positions. Each style and size of door has different reactions, and the loads it applies to the wooden structure. We've found that while some buildings initially cost less than others, here is what's really important: "Is the building package built to accommodate the size and door type of your choice?" Your doors should be specified early in the planning process, so building designers can incorporate adequate reinforcing. Schweiss will work with you, your architects, and your contractors or building supplier to ensure a perfect fit in your building. We supply door weights, engineering data, windload specifications, and design specifications to make certain that you have all the necessary information needed for the design of your pole building or frame shed to accept the Schweiss door of your choice. This information will insure a smooth and safe installation. Every door designed by Schweiss furnishes the building contractor/door owner a complete set of "Door Specs." When considering big garage doors for farm shops or machine sheds, you have four basic options: 1) sliding doors; 2) sectional overhead doors; 3) bifold doors; and 4) the new 'one-piece' hydraulic doors that hinge at the very top. Sliding doors were common for machine sheds in the past, but they are questionable choices for shop doors. Why? Because sliding doors are high maintenance...and if you insulate and line the inside of the shop door, you add weight which makes them heavier to open and close, and puts more stress on their hardware. Often snow and ice are challenges too. Sectional overhead doors have been used in farm shops for decades. Again, with sectional overhead doors weight has become an issue, as farm equipment and shop door openings have grown larger. "Those heavier sections require stronger, heavier rails, so everything gets bulkier and more expensive." With sectional overhead doors, you are limited in width, as big sectional overhead doors reduce vertical clearances in buildings because of the heavier tracks and bracing needed to support the extra weight. There are "low headroom" track systems that often require complicated opening systems. When installing this style door, especially in shop pole buildings, the door in the open position obstructs/blocks ceiling lighting. Pole buildings have eight feet between trusses so builders must add blocking and supports in the ceiling for the tracks and openers. Needing a larger door, and you're probably looking at some sort of bifold, or one-piece hydraulic door. Mike Schweiss, founder of Schweiss Bifold Doors, says, "Width isn't an issue for us. Thirty-two foot wide doors used to be common. We're putting in a lot of 40-footers now, and the aggressive guys are going to 50-foot doors. The biggest door we've built so far is 130-feet wide. There are many door options to retrofit your pole buildings. If the door is beyond the roof line, custom cutting the corners of the door will make your building look nicer and give you more headroom. If you want to open the whole end wall of your building up, running columns up and above or adding on to the existing posts to make sure you won’t lose any headroom is available. If you are short of headroom on a older building, one option is to extend your wood or steel columns and put your header up and above. A round roof building can be modified to hold a bifold or hydraulic door to stay within the roofline. Another possible option is the open the entire endwall to gain width and height. Sidewall doors can also be added. The building’s structural design must be capable of handling loads of the Bifold or Hydraulic door that could exert stress on your door header, endwall and building. The customer and building manufacturer are responsible to ensure the building’s structural design can carry the door. On an existing building, using a freestanding header is a good way to create a clean, flat, flush surface to attach a door to. The free standing header gives extra strength and provides a nice straight and level place to attach your door. This works great on older buildings. The cost savings in both labor and materials is a trade-off. Traditionally some pole barns have sliding doors. Sliding doors are a cheaper answer to the problem, but there are many problems to be considered. They don’t keep out critters, dust, dirt, and weather. In the winter the doors could get frozen. Sliding doors would not be a good choice to store valuable items. Using a sliding door on a daily basis can be a lot of work to latch and slide for every open and close, and the bigger the door the heavier it gets. s Sliding Doors have many flaws when compared to Bifold or Hydraulic Doors. During winter conditions the doors generally freeze shut and have to be shoveled to slide open. Sliding Doors don’t seal to the building as well as other doors do and they let in more of the outdoors. Sliding Doors have problems holding in warm air and are less likely to be insulated, making them more likely to be used on cold storage buildings. For a rarely used agricultural building, the door has some advantages. The door can survive more wear and tear than sectional overhead doors. Sliding Doors also don’t lock very tight to the building. Sliding doors aren’t a safe storage place for valuable or important equipment. In general it is just cheaper-built door. Bifold and Hydraulic doors secure and lock tight. You have to balance the cost of security versus the cost of machinery, boats, RV’s and planes stored in pole barn buildings. Convenience of an electric opener is especially important on buildings being used more than a few times a week. These doors are useful in a store or warehouse sending and receiving large products or pallets regularly. Hydraulic and Bifold Doors can both be opened to any position. A partially opened door can be used to moderate the temperature and control airflow in the building. Custom-made bifold and hydraulic doors can be built to any size and be clad to match any building. Insulation is more common on bifold and hydraulic doors than sliding doors. The tight seal on Schweiss doors helps keep the building at a warmer temperature. Wind-loaded doors secure the building better during high wind conditions, and bifold and hydraulic doors can be wind-rated for over 100 mph. Bifold and hydraulic doors are made industrial strength, and include heavy duty parts and components. Bifold and Hydraulic doors were originally hangar doors, but have found extensive use in commercial and agricultural buildings. It is easy to buy junk. Get Experienced door builders; cheap builders can be a costly mistake, get the job done right. Cheap doors are susceptible to damage. Compare and search for reputable builders and suppliers. Your building, door, equipment and your money are on the line when putting up a pole barn, as is your safety. Cold Storage buildings are fine without insulation. Hydraulic doors can be better at saving headroom when compared to other style doors. This is especially important on the eaves wall of a pole barn. Hydraulic doors swing out instead of lift up. This means vehicles and objects need to be parked farther away from the door during opening and closing. A window in the door is a great idea to make sure nothing such as planes, cars, or objects are in the way before opening. Hydraulic doors come in one piece, and provide a larger canopy than a bifold. Schweiss Hydrualic pumps are the best in the industry pump. Emergency, backup systems are available, such as a cordless drill, DC Battery Back Up, and backup tractor fittings. For safety purposes, doors come with Dead Man control switch, allowing the door to stop when you take your finger off the control station. If a hose breaks you want your door to safely lock up and stop motion when fitted with velocity fuses. With newly designed parts and components, Schweiss Hydraulic doors are state-of-the-art. Extra strong wrap-around hinges with grease zerks reduce stress on door components to Reduce stress and wear. On Cylinders. spherical bearings are used on both ends. This allows for flexibility of doorframe and take stress off pins and brackets when cylinders move. Robust cylinders stay straight. All-Steel members make a door stronger, and welded connections are more preferable than tec screws. Engineering stamps are available in all 50 states. You can park closer to a lift up bifold door, because it lifts vertically. Snow removal is not an issue in heavy snowfall area; the door will lift up out of the snow. The canopy is smaller compared to the hydraulic canopy. The slope of a bifold door allows snow and water to drain off a bifold door wedge. As the bifold door wedge gets bigger it reduces stress on the building. Multiple strap points carries loads at the attaching points reducing stress on the buildings. Strap doors have less parts, less problems and less maintenance than cable lift bifold doors. They seal and lock, keeping the outdoors outside to reduce cost of heating or air conditioning with a good seal and insulation. Get a door from a reputable builder or supplier. Compare, and shop around. Make sure builders aren’t cutting costs by reducing quality in the building - short cuts cost the customer. Some builders only know certain kinds of doors, and that is what they will sell you. Avoid costly mistakes; job needs to be done right the first time. If you’re building a cold storage building there is no need for insulation, and that can save a lot of money. Knowing door specs early allows you to know forces on the building, and can prevent a disaster. Hydraulic doors give more headroom and by lowering height of building you can maximize building height and costs. Terry Ahlbrecht farms near Hector, MN recently put up an 80'x 150' pole building for machine storage, with an eye to using it as a shop in the future. He installed two, 50' x 18' bifold doors on opposite ends of the building, to provide drive-through maneuverability. He started out wanting a big bifold and a smaller door, but it was about the same money for two big doors. Schweiss offers discounts if they can build and deliver two doors to the same jobsite. Bifold doors require only 24 inches of headroom; can be insulated to R-values equal to the sidewalls of building, and use a variety of lift mechanisms. Ahlbrecht's doors use lift straps, rather then steel cables. "If the door has a cable system and accidentally comes down on a piece of equipment sitting in the doorway, the cable "birdnests" like a fishing reel, and it's a mess to get it untangled," he says. Ahlbrecht went on, "Aside from not getting tangled, I like the lift straps because as the strap wraps around the spool, the radius of the spool increases so the door opens faster. So the door lifts slowly close to the floor, then moves faster as it moves to the wide open position. The One-Piece hydraulic door design is another alternative. Hydraulic doors are designed to swing out, requiring zero headroom. They're basically a wall hinged at the top that swings open. These single panel doors have one set of hinges across the top of the doorframe. The Schweiss One-Piece hydraulic door comes prehung, is watertight, easy to operate with the push of a button, easy to install, easy to insulate, and swings out providing a canopy when the door is in the open position. Powered by a powerful hydraulic pump, two heavy-duty cylinders activate the One-Piece hydraulic doorframe. The hydraulic pump can be conveniently located away from the door opening to keep the clean look and a quiet operation. 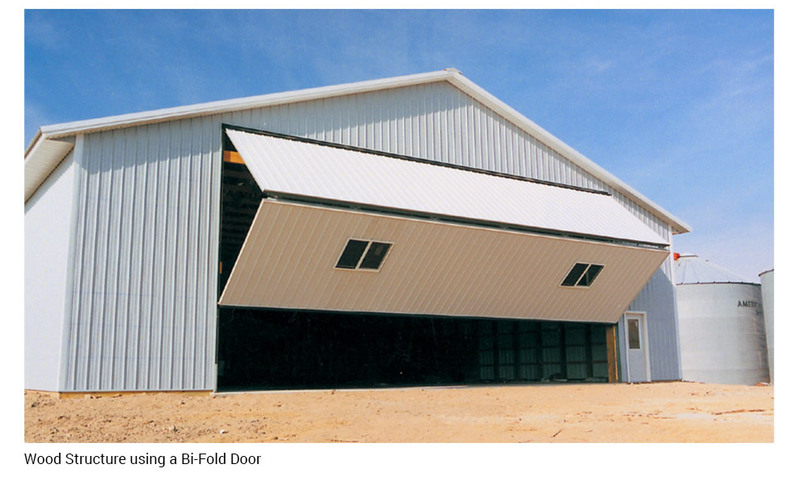 Hydraulic doors require no loss of headroom so retrofitting to existing structures can help you gain additional overhead clearance required to utilize your pole barn's full clearance opening. This is a real money saver! 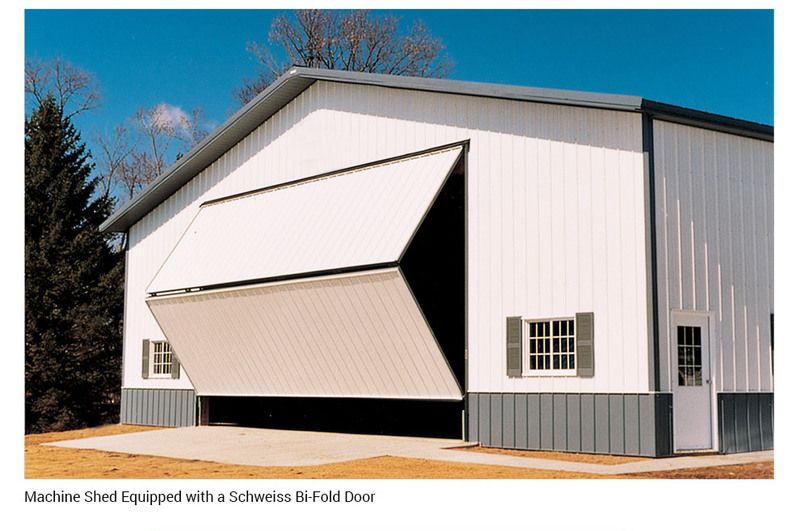 Schweiss, the industry leader in custom designed doors, offer choices when it comes to selecting doors for your equipment storage, farm shop and other farm buildings. Our One-piece hydraulics are a second option. Look for quality, look for price, you'll buy Schweiss.